Firstly I have to say that I loved this book because it had everything a reader could want. It had love, friendship, jealousy, chemistry and an edge of danger. This was the first book that I have read in the series as well as my first book by Kathryn Renard and I have found that I love her writing style which is both flawless and brilliant. I loved the way Kathryn never made the reader feel pity for Elijiah despite his injury and she depicted him as a physically and mentally strong veteran. Maddie's character was also very well written as she was a strong and independent girl who stuck to her beliefs and values and I really enjoyed her jealousy towards Elijiah and Josies relationship. The biggest plus point of the book was the inclusion of the sense of danger as this is what kept the book interesting. I do have a soft spot for Navy SEAL's and the chemistry between Elijiah and Maddie was sizzling hot. This was a great read and I am looking forward to reading the previous books in the Montgomery University series. 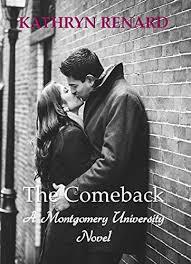 Maddie Cassidy, who is a physics major at the Montgomery University, meets injured Navy SEAL Elijiah Hart and in their first meeting sparks begin to fly. Elijiah is a war veteran who was forced into academia work after a devastating injury in the battlefield. After Maddie and Elijiah first disastrous meeting, Maddie finds out that Elijiah has a past with her best friend Josies. Elijiah begins to fall for Maddie's brains and beauty, but he is afraid that Maddie won't be able to look past his injury. As Maddie and Elijiah's relationship starts to progress a danger begins to lurk around Maddie. Will Elijiah be able to protect Maddie?